Murals along “Paseo Boricua” serve to remind us of the history of the Puerto Rican community. This weekend, Grassroots Illinois Action-Humboldt Park Area had its first general meeting after a small hiatus over the summer. We updated members about our Bloomingdale Trail campaign, the proposed city budget, the Dyett Hunger Strike, and other topics to keep our community informed about local and city politics. In the latter half of our meeting, we watched “Chicago’s Puerto Rican Story,” a film about Puerto Rican migration in Chicago. 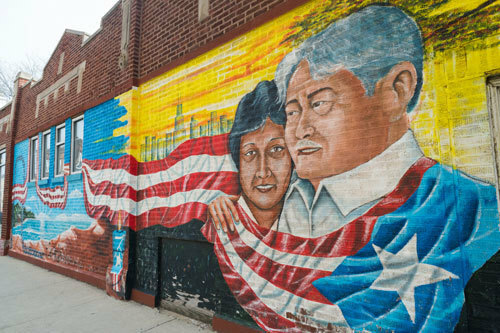 Ever since starting to organize with residents in Humboldt Park, there has been a desire to better understand the history of the Puerto Rican community. Every neighborhood’s today is impacted by a yesterday; we can’t do substantive work without understanding the context in which we work in. Within Humboldt Park, this is particularly important. The film discussed Puerto Rican migration across neighborhoods like Wicker Park and Lincoln Park in the mid-20th century. Urban renewal and highway construction displaced Puerto Ricans in Chicago. During that time, a Puerto Rican mecca of sorts was established in Humboldt Park. As Puerto Ricans moved into the community, white flight ensued, leading to a depletion of resources and an increase in poverty. This, coupled with the distrust of law enforcement, led to the Division Street Riots of 1966. Resulting from a police shooting of a Puerto Rican man, Humboldt Park was enveloped in a series of riots that resulted in millions of dollars in damages but also led to the creation of local community organizations. In the decade that followed, a wave of arson swept the neighborhood. Residents in the film described the lingering impact of white flight, as landlords would rather see their buildings burn rather than have Puerto Ricans as tenants. As a result, empty lots dotted the neighborhood. Given the precarious nature of housing, gentrification was a concern even then. Fittingly, we ended the movie with a section on the gentrification of Wicker Park and West Town in the late 20th and early 21st century. A process supported –if not fully orchestrated –by city government resulted in the influx of white professionals, which often led to the displacement of long-time residents. As a way to preserve the Puerto Rican history and identity of the neighborhood, two 59-foot Puerto Rican steel flags were erected near Western and California Avenue in 1995, serving as gateways to “Paseo Boricua.” Much of the movie sheds light on a people’s search for community in the midst of the forces of displacement, which still rings true today. After the viewing, there was a silence, one of those reflective silences. Reliving history for some or learning it for the first time was powerful to experience together. A lifelong resident said, “I just relived 50 years of my life through that movie.” Another long-time resident drew the connections to current policies. Through tears, she said, “The processes from the past, they are the same things they are doing to us now. Different name, same result.” From the mayor’s proposed property tax hike to Humboldt Park school closings to gentrification along the 606, many Humboldt Park residents feel they are again being starved of resources and being pushed further west. Pushed west from Lincoln Park, pushed west from Wicker Park, pushed west from West Town, now being pushed further from Humboldt Park.